James Walter's Dodge Caravan (foreground) slammed the front left fender of Joseph Bolt's Dodge Dakota (background) when, according to witnesses, Bolt ran a red light. Failure to Yield Hospitalizes One, LIVINGSTON, May 17, 2011 - At Approximately 12:15 pm on May 16, 2011 a white Dodge Caravan driven by James Walter, 58, of Livingston, was west-bound on US-190 West and attempted a left turn onto FM-350 South. 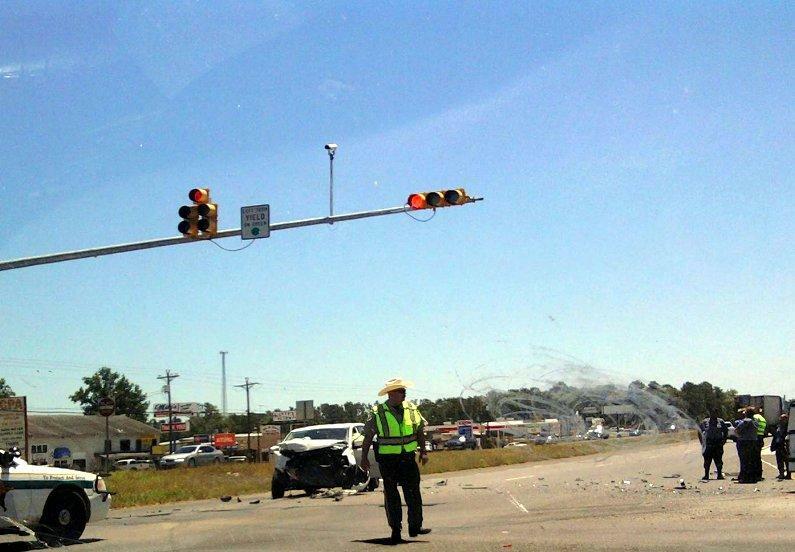 As Walter was crossing over the east-bound lanes of 190 he slammed into a white Dodge Dakota driven by Joseph Bolt, 66, of New Caney. According to witnesses, Bolt ran a red light and Walter had the right-of-way. Walter's vehicle came to rest in the east-bound lanes of 190 while Bolt's vehicle came to rest on the sidewalk at 350 near First National Bank. Americare Ambulance Service was dispatched to the scene along with Deputies from the Polk County Sheriff's Office and Officers from the Livingston Police Department including Chad Ward, Sergeant Ronny Bogany, and Kevin Ward. Traffic in the east-bound lanes of 190 and 350 were partially blocked during investigation and cleanup. James Walter was transported to Livingston Memorial Hospital with undisclosed injuries while Joseph Bolt was physically okay. According to Officer Chad Ward, several witnesses stated that Bolt ran a red light and that Walter had the right-of-way. Officer Ward cited Bolt for running a red light. Harwood Wrecker Service recovered both vehicles. Walter's Dodge Caravan will be stored at Bounds Autoplex in Livingston while Bolt's vehicle was towed to New Caney. The scene was cleared by 12:51 pm. This picture was sent in by reader Robin Morgan. Deputy Monty Lee helps control traffic. James Walter's Caravan sustained heavy damage and may be totaled. Joseph Bolt's Dakota was slammed on the front driver's side fender. Monty Lee with Polk County Sheriff's Office helps with traffic control. Officer Chad Ward speaks with Joseph Bolt of New Caney. Bolt was cited for running a red light. Both vehicles were recovered by Jim Harwood.